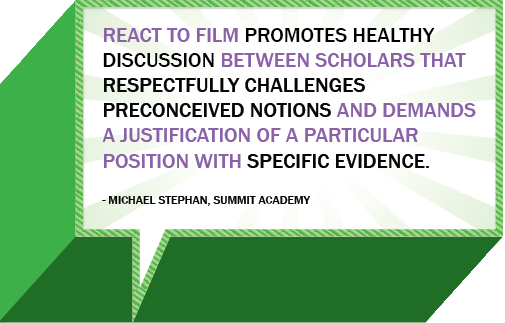 REACT to FILM educates youth through the power of documentary film to be engaged social citizens of the world. Our curricular resources allow schools to educate on a spectrum of social ailments from the psychosocial effects of war to nutrition, from gun policy to gender inequity, from conflict mediation to homelessness. Leveraging the best issue-based filmmaking to promote social responsibility and spark civic engagement, REACT to FILM is a platform of educational programs in high schools and colleges.